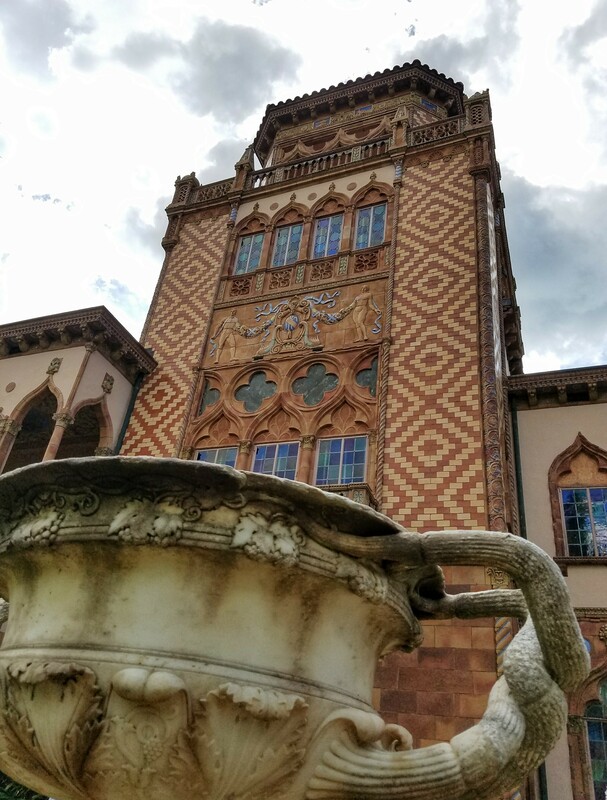 Where did you spend Museum Day Live? Me? 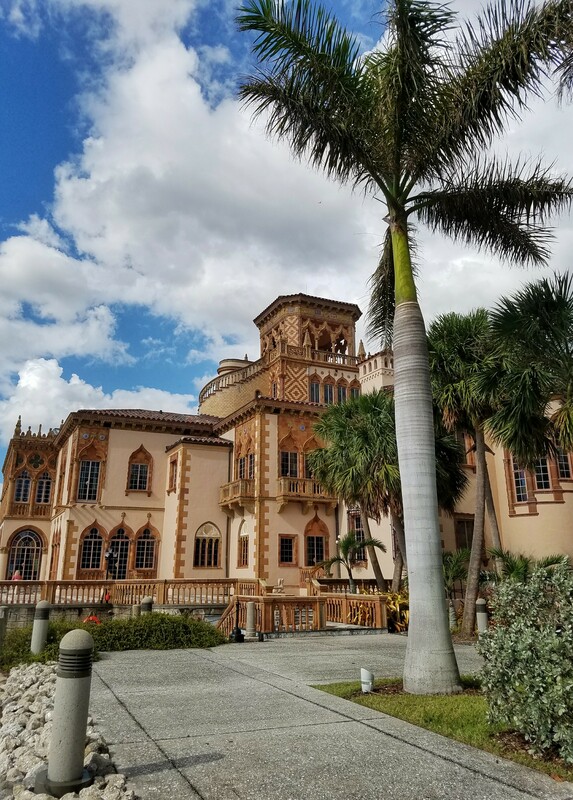 I paid a visit to The Ringling in Sarasota, FL. Because, HELLO. Free admission! That’s right. The Smithsonian Mag’s 13th annual Museum Day Live was Saturday, September 23, and a BUNCH of museums around the country were FREE. Who doesn’t love free?! 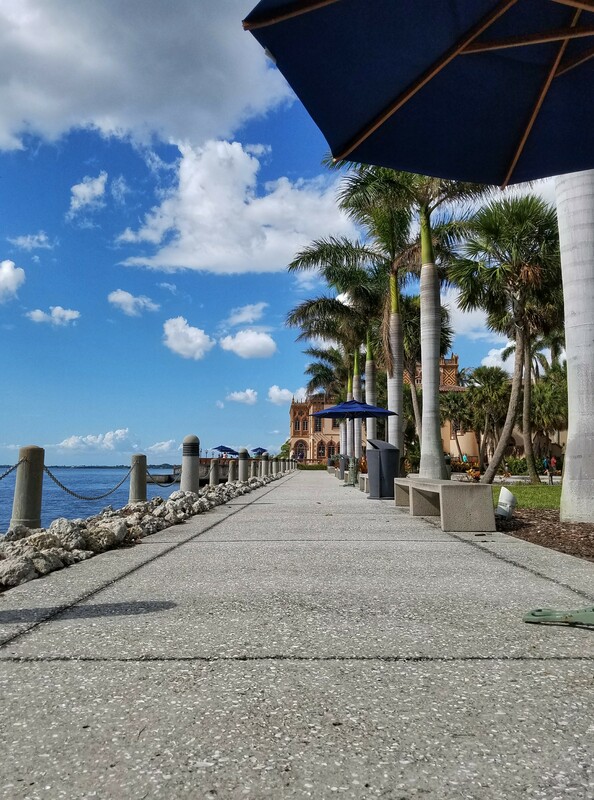 I hadn’t visited The Ringling grounds since December 2013 – less than a month before I officially moved to Sarasota. Shame on me, right? Why don’t I go more often? This place really is a gem. 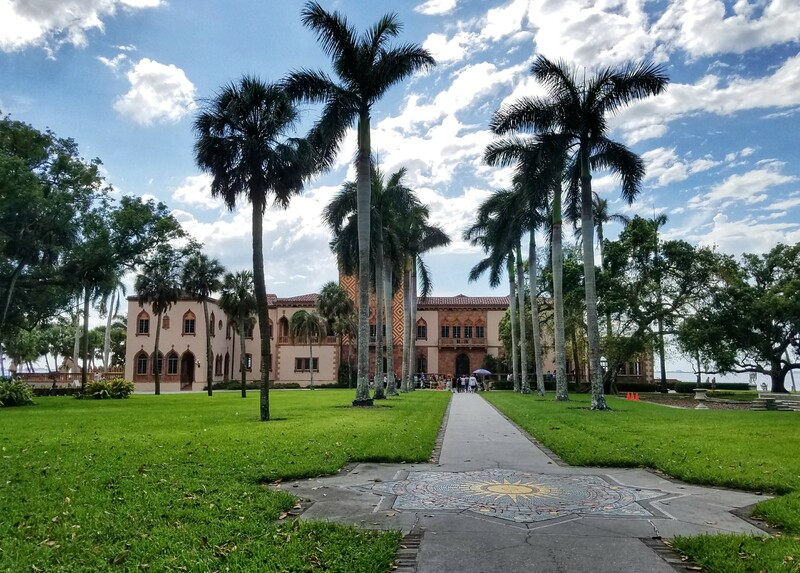 I mean, there’s a bona fide art museum, a circus museum, a restored 1798 Italian theater, an opulent 1920s Venetian-style mansion on the bay, and the loveliest gardens in the middle of it all. 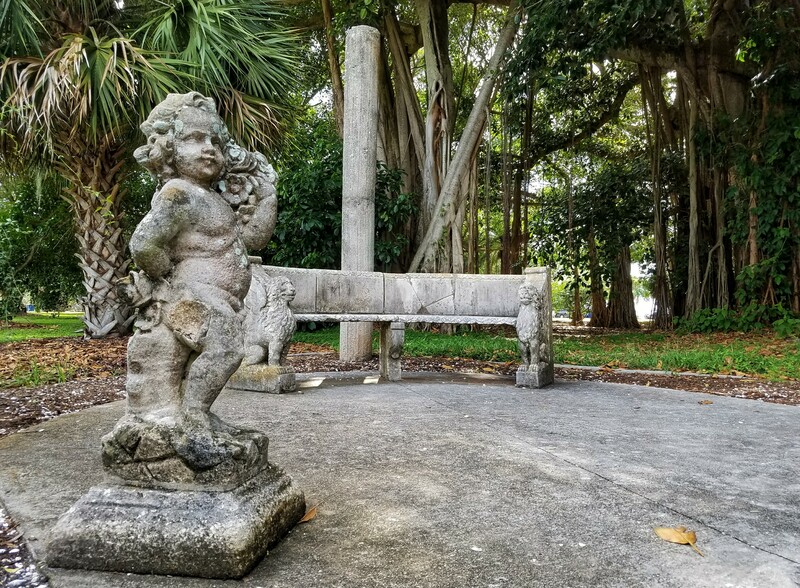 For this visit, I stuck to the gardens and that mansion, Ca’ d’Zan, once the winter home of John and Mable Ringling… yes, of Ringling Circus fame. Mable’s rose garden is my favorite of all the garden areas. And it’s right on the way to the mansion, so I literally HAD to stop and smell the roses. I spent a good twenty minutes admiring all the different varieties, reading their names and years of origin, and yes, yes, yes, smelling them! 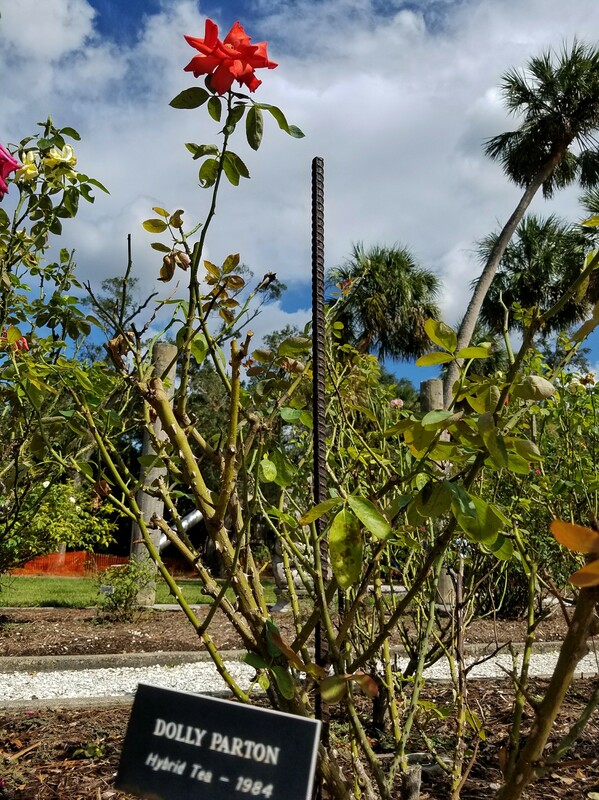 Favorite rose name? The Dolly Parton. 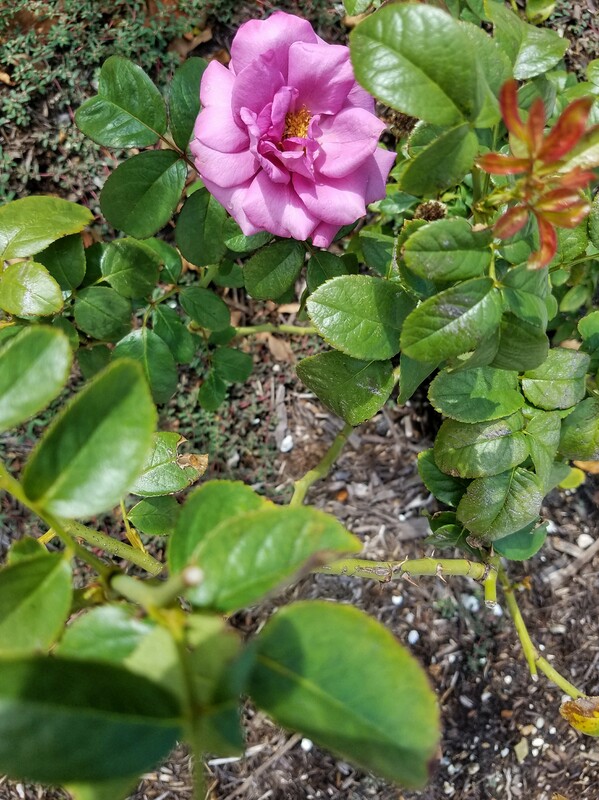 Favorite rose for its beauty? The Plum Perfect. 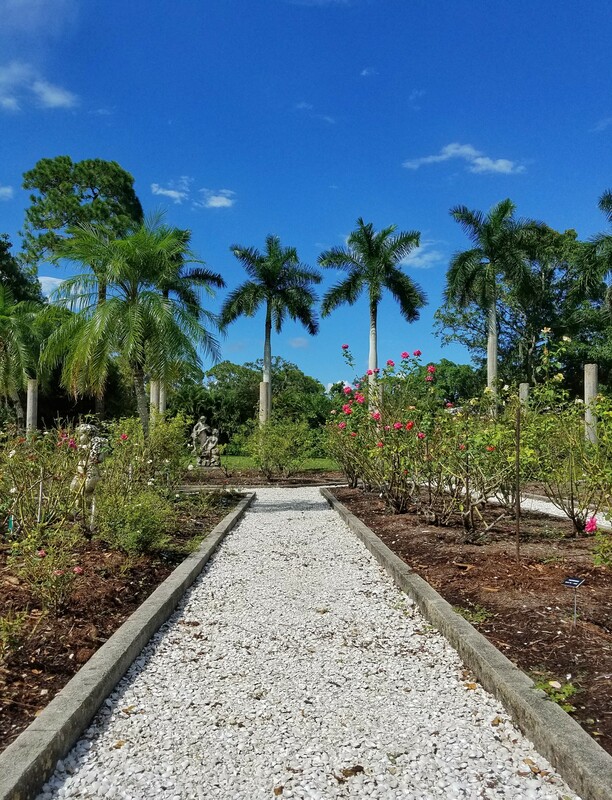 The entire grounds have a uniquely tropical Italian feel. Statues are everywhere. Banyan trees, too. And then there’s Ca’ d’Zan, the true showstopper of the entire Ringling grounds. Its position at the end of the property, overlooking the bay, is quite literally jaw dropping! 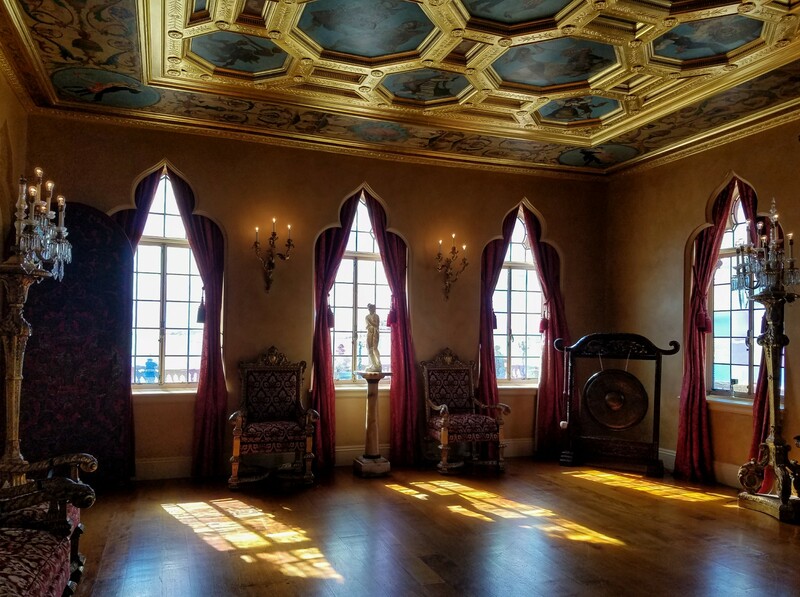 That vibrant, exquisitely detailed exterior is fit for royalty. So’s the interior. Here, I’ll show you. See what I mean????? I could NOT stop with the photos. Thankfully, non-flash photography is allowed in the house. The basic tour is unguided, and only includes the first floor. 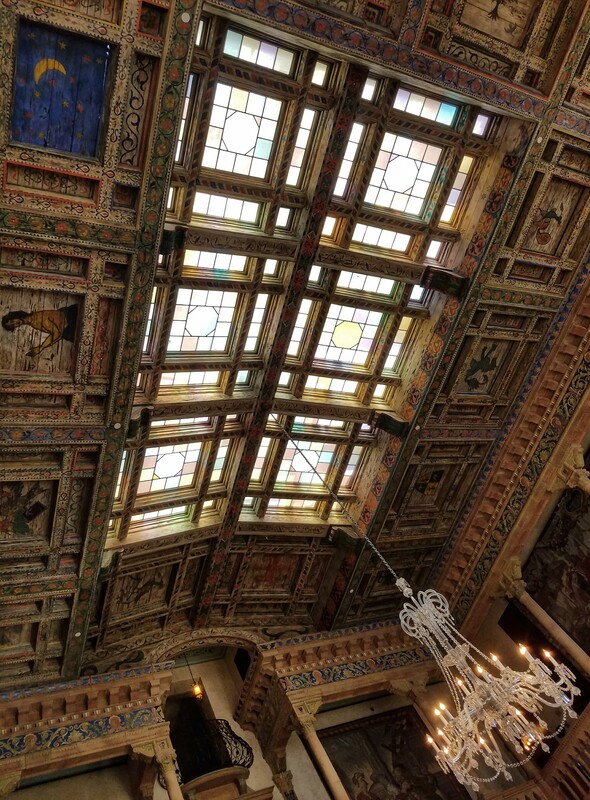 If you want a docent tour and/or neeeeeeed to see the upstairs, check out The Ringling’s website for details. I personally haven’t done either… yet. But I will. 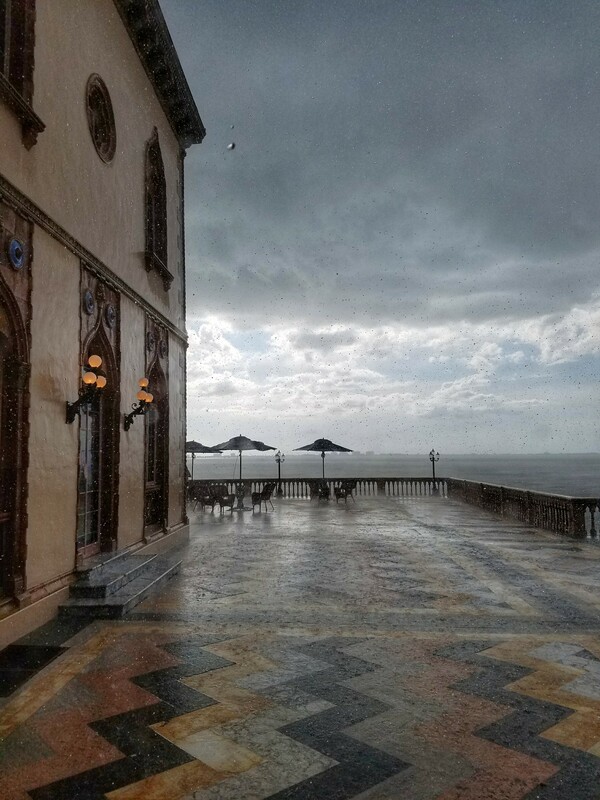 After the mansion tour I had just enough sunshine left to snap photos of the bay and terrace before the darkest storm cloud rolled in and ruined everything! Ok, not really, but it did let loose so hard that my bitty umbrella didn’t seem up for the challenge of thunder, lightning, and rain that forms puddles in seconds. I made the smart decision to step back inside the queue area for tour groups till the worst passed. 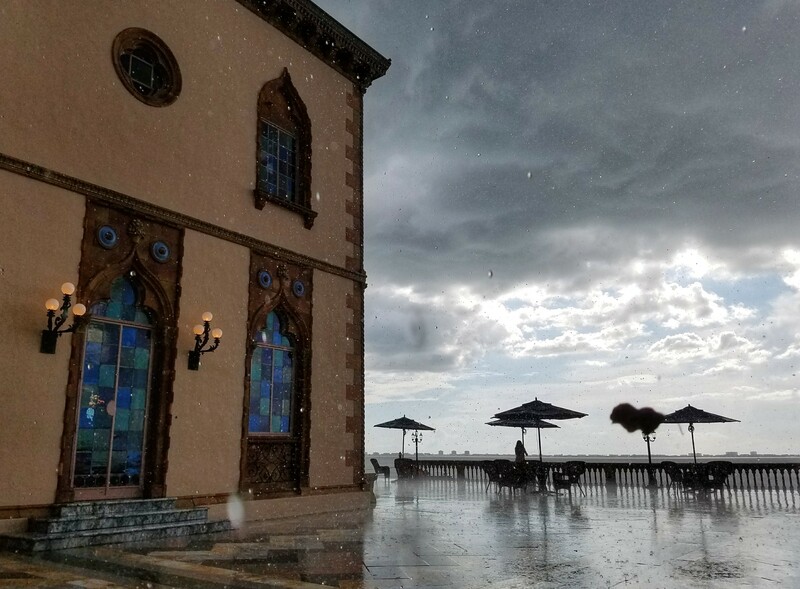 But, since it was nearly closing time, my umbrella and I headed back to the entrance in still-fairly-heavy-thundershower conditions. 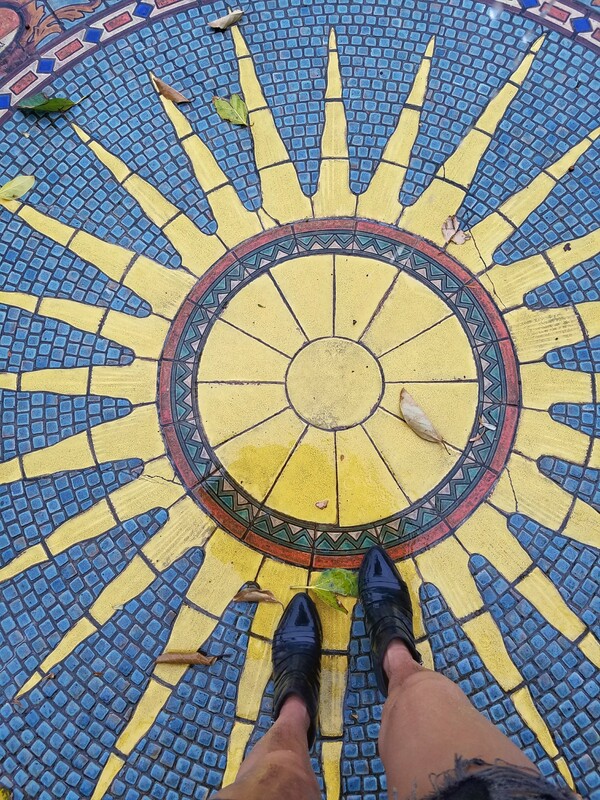 The ankle boots I wore… full of water. I was sloshin’ around like a puddle-jumping kid! Even with the rain, I thoroughly enjoyed my adventure at The Ringling. It took Museum Day Live for me to visit this place again, and I sure don’t wanna wait another 3 ½ years for the next time! And next time, I’m hitting the Museum of Art and the Circus Museum – which are also free EVERY Monday, by the way. Conclusion? 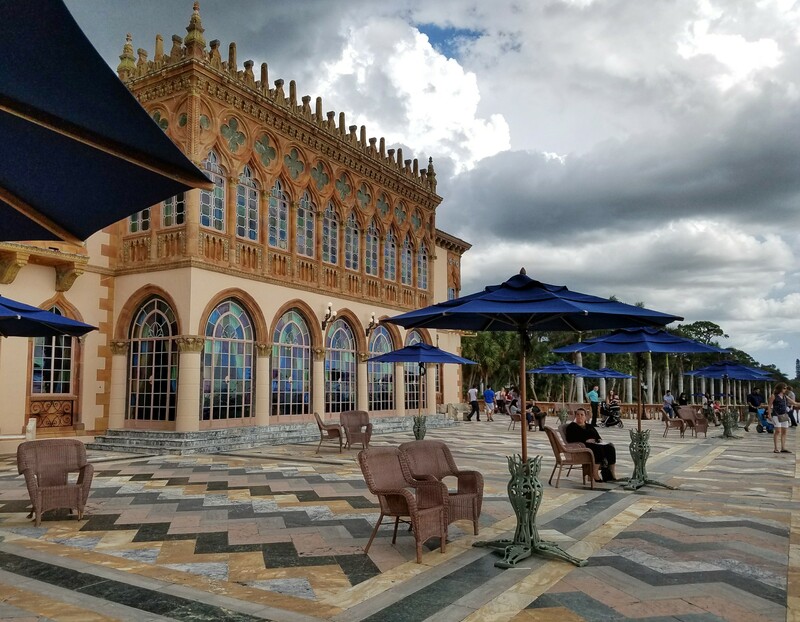 If you live or vacation in the Sarasota area, The Ringling is absolutely worth your time. There’s basically something for everybody here! Did you put on your tourist hat for Museum Day Live? If so, where’d you go?